Epp, Frank H. and Leo Driedger. "Mennonites". The Canadian Encyclopedia, 29 August 2016, Historica Canada. https://www.thecanadianencyclopedia.ca/en/article/mennonites. Accessed 18 April 2019. The first Mennonites in Canada arrived in the late 18th century, settling initially in Southern Ontario. Today, almost 200,000 Mennonites call Canada home. More than half live in cities, mainly in Winnipeg. The Amish Store on July 19, 2012 in Balderson, Ontario. 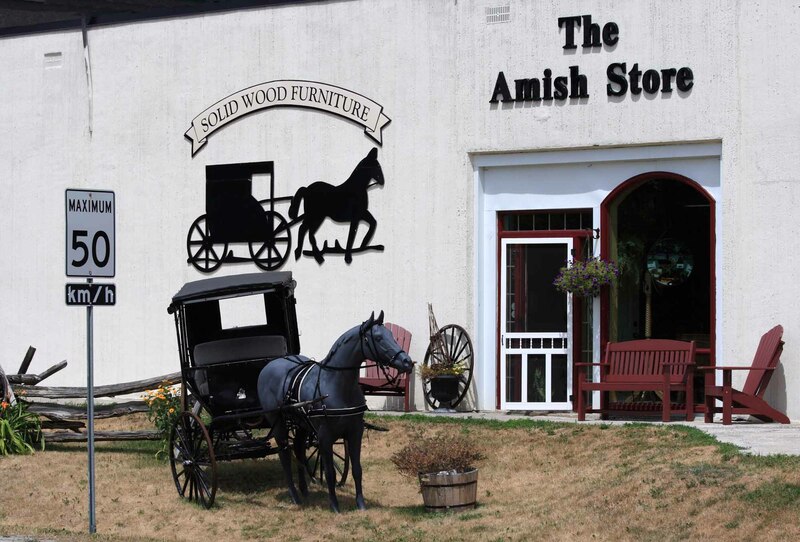 The store sells Amish and Mennonite furniture custom built in Indiana, Ohio, Pennsylvania, and Ontario. 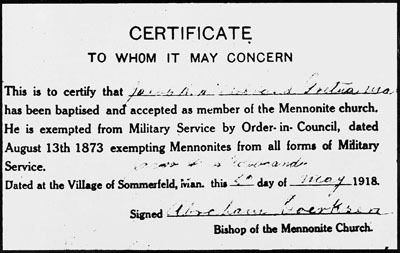 Certificate of exemption from military service of a Mennonite young man in southern Manitoba (courtesy Mennonite Heritage Centre Archives). Mennonite Church, Kitchener, Ontario (courtesy Malak, Ottawa). 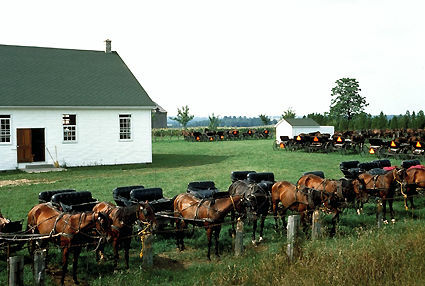 The first Mennonites in Canada arrived in the late 18th century, settling initially in Southern Ontario. Today, almost 200,000 Mennonites call Canada home. More than half live in cities, mainly in Winnipeg. Some, such as the Old Order Amish and Old Order Mennonites, shun all technology and live traditionally. Others use modern machinery and electronics and integrate into mainstream Canadian life. Mennonites are a religious-cultural group established in the 16th century during the Protestant Reformation when some Christians separated from the Roman Catholic Church. Mennonites date their separate Christian identity to the Anabaptist movement of the early 16th-century Reformation. Anabaptist (literally "rebaptizers") and Mennonite ordinances differ from other Christian denominations in that baptism is a choice made by mature voluntary believers (not infants); the communion service sometimes includes foot washing as a symbol of humility and service. During the 16th century, the Anabaptist movement spread through Europe under various leaders. In the northern German states and the Netherlands, Menno Simons became an influential leader. He was originally a Roman Catholic priest but had doubts about infant baptism. In 1536, he left his position with the Catholic Church and soon became the leader of the Anabaptists in the area. People in this community became known as Mennists, and later Mennonites. Through prolific writing, preaching and tireless organizational work, Simons strengthened the movement. The peaceful "Mennists" were persecuted, and scattered throughout Europe and North America. The Swiss-South German Mennonites went mostly westward, settling in Alsace and the Palatinate, and by the end of the 17th century many had relocated to Pennsylvania. The Dutch-North Germans went mostly eastward, forming settlements in present-day Poland, and by the end of the 18th century in Russia. The Mennonites' relative isolation and self-sufficiency within closed communities, combined with their conviction that religion was a way of life, produced a unique socio-religious culture. Mennonites first began arriving in Upper Canada around 1776. Since Mennonites originated in German-speaking countries, the German language has been one of their defining characteristics. Because of this, many of the Mennonites who came to Canada, especially during the early years of immigration, were perceived as a minority group with ethnic as well as religious characteristics. The first migration to Canada brought about 2,000 Swiss Mennonites from Pennsylvania to Upper Canada, during and after the American Revolution. They acquired land from private owners in the Niagara Peninsula and in York and Waterloo counties. This group was followed by Amish Mennonites (named after Bishop Jacob Ammon, a conservative leader of the late 17th century). From 1825 to the mid-1870s, about 750 settled on crown land in Waterloo County and nearby. In the 1870s, the Russification policies of the Russian government caused 18,000 Dutch Mennonites — one-third of the total in Russia — to leave for North America. The promise of land, cultural and educational autonomy, and guaranteed exemption from military service, attracted about 7,000 of them to southern Manitoba. The homestead lands in the North-West Territories attracted Mennonites from Prussia, Russia, and the US between 1890 and the First World War. Many of the new immigrants moved to Manitoba and the Prairie provinces and others created Mennonite communities in Saskatchewan and established congregations in Ontario. Conscription in the US in 1917 brought more Mennonites to the Canadian Prairies. However, the largest immigration wave occurred in the 1920s, when 20,000 Mennonites escaped famine and the effects of the Bolshevik Revolution. Subsequently, during the Second World War more than 12,000 Mennonite "displaced persons" migrated to Canada from the USSR and Germany and most settled in urban areas. Following the Second World War, the third major wave of approximately 8,000 Mennonites migrated to Canada. Since then many Mennonites have emigrated from the US, Mexico and Paraguay. The 2001 census recorded 191,000 Mennonites in Canada. More than half of all Mennonites live in cities and the shift from traditional rural communities to urban living has mirrored that of the general population. In 2010, the largest concentration of urban Mennonites was located in Winnipeg, Vancouver, Saskatoon and Kitchener-Waterloo, each fed by large Mennonite rural communities. Winnipeg has one of the largest urban Mennonite populations in the world with more than 20,000 Mennonites and 45 Mennonite churches. Mennonites and their congregations differ in their attitudes toward innovation in religious and cultural life. Some believe that lives of discipleship, in communities separated from the world, are essential and attempts are always made to control change. Others insist that adaptation and involvement in the world are essential to the Christian mandate. Among both the Swiss and the Dutch are conservative groups that have successfully perpetuated traditional rural modes of life, unchanging clothing styles, dialects and liturgical forms. The Old Order Amish and Old Order Mennonites, sometimes called "horse and buggy" Mennonites, have rejected the use of modern technology such as electricity and motorized transportation, and have succeeded in continuing a traditional farming style. Most use tractors and mechanized equipment, though a few very conservative Old Order Mennonites use a horse. Driver’s licenses are forbidden, though motorized transportation may be hired for longer distances. As of 2013, the number of such communities in Canada was estimated at 10 to 20, or roughly two per cent of the total Mennonite population. Both men and women opt for plain, simple clothing, the women wearing caps and the men, black hats of either straw or felt. Old Order Mennonite men are clean-shaven and use buttons on their clothes (unlike their Old Order Amish counterparts). Most Old Order Mennonites have telephones, running water and hydro, and use freezers and washing machines but not dryers. The community allows for two phones per family, but without accessories on the phones. They do not use fax machines, computers, television, or radios. Courting occurs after singing meetings or youth work groups. Weddings take place in the middle of the week at the bride's home. Old Order Mennonites accept neither health care nor education paid by the state. At times, parents discipline their children through corporal punishment, which in a few cases has led to the involvement of local child protection agencies. Politics have represented a problem for Mennonites. On the one hand, Mennonites discouraged any involvement in an evil world in which force and violence were used even as instruments of the state. On the other hand, they encourage application of the ethics of Jesus: love, peace and justice in all areas of life, including the state. Today, most Mennonites vote and a number serve in elected office and as civil servants. In their rural past, Mennonites thought of themselves as "the quiet in the land," but James Urry (2006) suggests that they have become "the loud in the land." Mennonites are no longer limited to their Swiss and Dutch traditions and ethnic backgrounds. There are many Canadian Mennonites of French, Chinese, Indian and Anglo-Saxon ancestry, and increasing percentages of Mennonite marriages are mixed. Mennonites in Canada are undergoing rapid change, but a strong emphasis on the family and the role of religion, specific programs to keep the young people involved (youth organizations, camps, choirs, service programs), special schools, and a dynamic congregational life minimize the loss of members to the larger secular community. In 1903, Mennonite congregations from Manitoba and Saskatchewan established the Conference of Mennonites in Canada. The term "conference" is similar to "synod" or "district" in other Protestant denominations. As more congregations joined, the conference name was changed to the General Conference of Mennonites in Canada (1932) which later became the Conference of Mennonites in Canada. In 2000, the name changed again to the Mennonite Church Canada. It is the largest Mennonite group in Canada and has its headquarters in Winnipeg; it includes the Mennonite Eastern Canada, Manitoba, Saskatchewan, Alberta, and British Columbia conferences. Congregations are organized into provincial and national conferences, but each congregation is autonomous within the conference regarding its policies. Many Mennonite conferences have reorganized to deal with new challenges such as evangelism and church planting, pastoral leadership, and outreach as well as social issues, Aboriginal ministries, peace concerns, ordination of women, inter-conference relations, periodicals and post-secondary education. Most congregational families are members of provincial, national and continental central committees. Persecution during the 16th century made migration essential for the Dutch Mennonites who moved from Holland to Poland, Ukraine and North America. By 1920, the Mennonites living in the Ukrainian areas of Russia were threatened by the Russian communist revolution, prompting North American Mennonites in Canada and the US to send ambassadors and relief in the form of food and clothing. Mennonites in general increasingly withdrew to form exclusive Mennonite communities that became preoccupied with survival and retention of their Anabaptist and Mennonite identities. During the two World Wars Mennonites resettled in Paraguay, Canada, the US and many other countries. Mennonite services developed over the last 100 years, evolving from early humanitarian aid into the Mennonite Central Committee (MCC). What began as a goal of rescuing Mennonites from Ukraine became an outreach opportunity through missionary work and service. Today, the MCC also provides emigration and immigration services, agricultural aid, mental health support, employment counselling, disaster relief, and other services and has become a worldwide social service agency in 60 countries serving not only Mennonites but individuals from all denominations. In 1950, the Mennonite Service Organization was established in response to tornadoes in Oklahoma and flooding in Manitoba. The agency was renamed the Mennonite Disaster Service agency (MDS) and today, in addition to providing disaster response assistance, the agency's work includes community projects such as building low-income housing. The MCC provides disaster relief internationally and the MDS responds to emergencies in Canada and the US. Peace and peace projects are also central to Mennonite life. Each year, the community celebrates Peace Sunday as a corollary to Remembrance Day. The MCC also promotes conscientious objection through petitions and literature, encourages youth to decline careers in the military and has a website called "O Canada: armed and ready," with a section called "Who would Jesus bomb?" As a church that emphasized separation from the world and social nonconformity, Mennonites frequently resisted the influence of state-run public schools. Today, Canadian Mennonites operate elementary education, private high schools, colleges and one graduate theological centre. Students seeking training for pastoral ministry can attend the Mennonite Brethren Biblical Seminary Canada, which offers the Master of Divinity, among other degrees. The Canadian Mennonite University (CMU) comprises three colleges located in Winnipeg, which were amalgamated to form the university: Mennonite Brethren Bible College (est. 1944), the Canadian Mennonite Bible College (est. 1947), and the Menno Simons College (est. 1989) which operates on the University of Winnipeg campus. The CMU has had degree-granting status since 1998. Through the University of Waterloo in Ontario, the Conrad Grebel University College offers undergraduate and graduate degrees in the Mennonite faith. In 2010, the college established the Centre for the Study of Religion and Peace. Canadian Mennonite periodicals include the German-language Die Mennonitische Rundschau (published 1880–2007), Der Bote (published 1924–2008), Die Mennonitische Post and the English-language Mennonite Brethren Herald and Canadian Mennonite. Two scholarly journals are also published: the Journal of Mennonite Studies and the Conrad Grebel Review. The Mennonites in Canada are renowned for their choral singing (see music of the Mennonites). The only music allowed in the Amish, Old Colony, and Old Order churches is unaccompanied unison congregational singing. In most other Mennonite congregations, singing is in four-part harmony, sometimes accompanied by the organ or piano and usually conducted by a songleader. Frequent song festivals, or Sängerfeste, held everywhere in Canada, include annual events in the west. Frank Epp, Mennonites in Canada, 1786-1920 (1974) and Mennonites in Canada, 1920-1940 (1982); Winfield Fretz, The Waterloo Mennonites: A Community in Paradox (1989); Howard Kauffman and Leo Driedger, The Mennonite Mosaic: Identity and Modernization (1991); T.D. Regehr, Mennonites in Canada, 1939-1970 (1996); Leo Driedger, Mennonites in the Global Village (2000); Adolf Ens, Becoming a National Church (2004); James Urry, Mennonites, Politics, and Peoplehood (2006); Conrad Kanagy, Road Signs for the Journey (2007); John J. Friesen, Building Communities: The Changing Face of Manitoba Mennonites (2007); Marlene Epp, Mennonite Women in Canada (2008); Leo Driedger, At the Forks: Mennonites in Winnipeg (2010). Canadian Conference of Mennonite Brethren ChurchesThe official website of the Canadian Conference of Mennonite Brethren Churches. Mennonite Historical Society of CanadaThe official website of the Mennonite Historicial Society of Canada. Check out the extensive Global Anabaptist Mennonite Encyclopedia Online for more information about Mennonites.